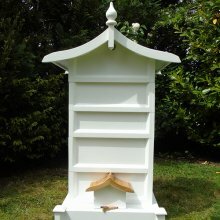 The Lichfield Bee hive is our own design. We wanted it to be handsome and be an attractive piece to fit into a garden, so we did not want to be too restricted. However, it is designed to take DN4 frames in the brood boxes and SN4 frames in the super boxes. This is curved and constructed of twelve millimetre thick cedar stripes lined with marine ply and given an oil finish. We used to finish cedar with varnish but have found that the oil finish is more practical and looks better too, in our opinion. Bees do survive in cold weather relatively well, but when damp their chances of survival are greatly reduced. undercoated and finished with Farrow and Ball exterior paint.The inside is fitted with rails on which the brood frames are suspended. This is where the queen and the bee colony effectively live. 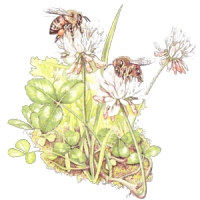 This is where the queen lays her eggs and where the young are reared. Stores of honey and pollen will also be held in this area. The Super Box. These are known as honey supers and this is where the bees store their surplus honey. This is the honey that the bee keeper harvests. We have designed our supers to take the smaller frames for their lightness and easier handler ability. Our supers are built in the same manner as our brood boxes, but are shallower. These are needed to support the wax foundation and this is where the bees build their honeycomb. 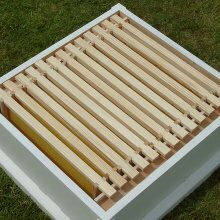 In order to maintain space for the bees to move freely we use Hoffman frames in our hives. 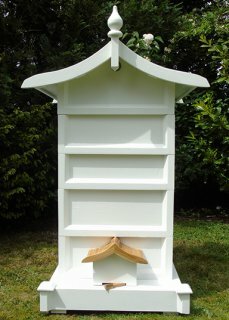 The crown board is a way of closing the top of the hive so that the roof can be easily removed. 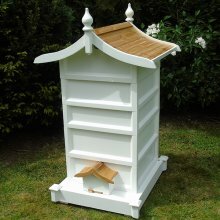 In this way you can also place containers of syrup made from white sugar on the crown board to feed your bees if there is a shortage of nectar. This completes the main section of the hive and it can be solid or constructed from mesh. Ours are solid, made from twenty millimetre thick planking. Allium siculum, Sicilian honey garlic. 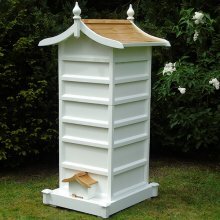 Hand-crafted wooden bee hives from our countryside workshop in Shropshire. There nothing more beautiful than timber, with its natural affinity with our gardens as well as being the only material that is a renewable resource used for the manufacture of bee hives. So about as green as you can get. 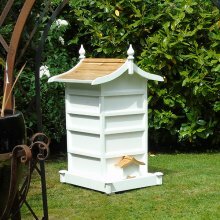 These beautiful bee hives will add an extra element to your garden as well as being a wonderful home for your honey bees. Keeping them dry and warm in the winter as well as cool in the summer with their solid wooden roof, walls and floor. They will also have an opening and closing front door to restrict entry, at your discretion.